On July 24th, 1897 a girl was born in a small town in Kansas, who would later become an American legend and aviation pioneer. Her name was Amelia Mary Earhart and during her short 39 years of life (that we are aware of), she was to set numerous aviation records, and was one of the first female pilots to achieve celebrity status all around the world. The charismatic, confident and independent Earhart became not only a national icon in the States, but was (and still is) regarded as a feminist icon, daring to tread in the exclusive "boys only" arena of aviation at the time, and spurring a whole new generation of women to believe in themselves and squash stereotypical perceptions of women. In May 1923 she was the 16th woman to receive a pilots licence by the then aviation authority, after setting a world record for female pilots 7 months earlier. She was selected to be the first female passenger on a trans-atlantic flight five years later, writing a book on her experience which would see her being called the "Queen of the Air." Earhart's fame grew when she became the first woman to fly solo non-stop across the Atlantic in 1932, and during the early 30's began contemplating a circumnavigation of the world flight - in March 1937 she attempted to start said record flight but due to the plane needing repairs the flight was postponed. On June 1st, Earhart and her co-pilot/navigator Fred Noonan flew out from Miami and over the next month made several stops in South America, Africa, India and Asia before arriving in New Guinea on the 29th, having completed 22,000 miles (35,000 kms) of the journey. On the 2nd of July they departed for a small piece of land named Howland Island, situated a little north of the Equator in the Pacific. However Earhart, Noonan and their aircraft were to vanish without a trace soon after. The US Coast Guard vessel assigned at Howland Island, to guide them via radio transmissions, received a final message indicating that the pilot could not locate the island, and that they were low on fuel, before all contact was lost. A number of search efforts, beginning an hour after her last transmission, turned up nothing, even though search efforts lasted 3 weeks. Earhart was declared legally dead in early 1939, and the US Navy concluded that the Lockheed Electra plane ran out of gas and sank into the ocean near Howland Island – however, no wreckage was (or has ever been) found. The fact that a distress or mayday call was never made has fueled rumours over the years of some kind of conspiracy taking place, that the public have not been informed of the full "real" story. So what did happen to Earhart and Noonan? Over the years many have speculated about what their fate was and a number of theories have emerged. Many believe that the official crash and sink theory is wrong and that perhaps due to an error made by Noonan in his navigational calculations, they may have crash-landed on the wrong island or a nearby atoll, where they perhaps perished soon after due to injuries. Perhaps the Navy missed them in their search efforts? A disturbing notion emerged that Earhart was a secret US spy who was working to gather evidence, during this flight of Japanese activity in the Pacific, and was to report back to the US Government when she returned. A WWII-era film named Flight for Freedom reinforced this myth, with the film ending with the Japanese becoming aware of the characters mission, forcing the heroine to ditch her plane off-course where nobody can find her. Did this scenario really happen? Another scenario put forth is that the Japanese may have shot them down and captured both pilots, whether or not Earhart, or both her and Noonan were spies, and held as prisoners for years afterwards, perhaps even being executed. Inhabitants of an island named Saipan,which is roughly 1500 miles northwest of Howland Island, have claimed for years that in 1937 the local prison held "a white American woman who was captured on a plane and is a spy." One man claims to have seen two graves he was told held the bodies of two American spies shot down over the Pacific. 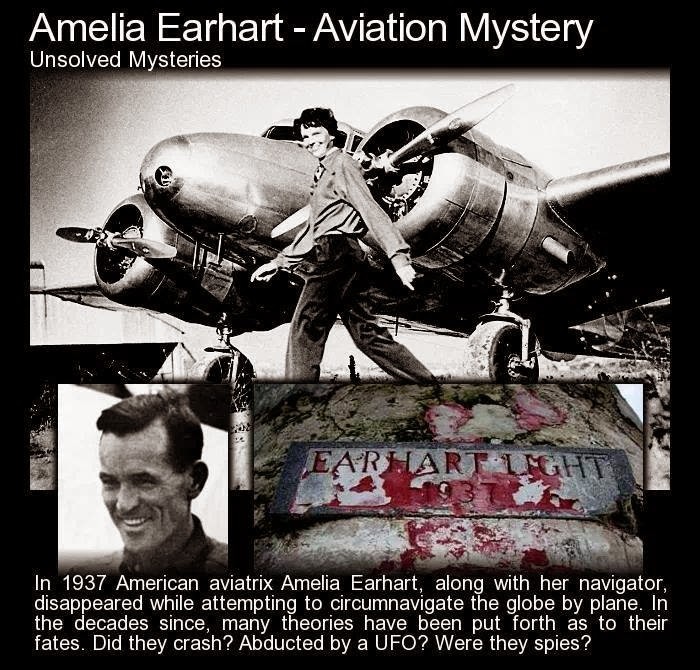 It has also been claimed that at some point US Marines supposedly found Earharts briefcase in a safe on Saipan, and photographs have emerged supposedly showing not only Earhart during her captivity, but wreckage of the plane which was claimed to have been destroyed by the Japanese army. In 1970 a book was released called 'Amelia Earhart Lives' and made the claim that Earhart had in fact finished the flight, moved to New Jersey, changed her name and re-married. She was named as one Irene Craigmile Bolam, but research showed that the woman could not be the famous aviatrix and she subsequently filed a lawsuit against the author and publisher! In 1990, US television show 'Unsolved Mysteries' interviewed a woman who claimed to have witnessed the two being executed. The photos and this persons claims have either been proven false or remain mysterious. Many other locals of the island have come forth over the years telling their re-collections of seeing or hearing of Earhart and Noonans' presence. Of course, it was also speculated that Earhart and Noonan were abducted by a UFO, or were found by the Nazis and held prisoners, maybe perhaps both were brainwashed into becoming double-agents, allied to watch American activity and after fulfilling their work, made new lives for themselves in another country? Or perhaps Noonan killed Earhart, then himself, to fulfill some mysogynistic ideal to stop females advancing in a "man-orientated" world? This mystery is sure to be one that will tantalize and stir the curiousity of generations to come. But what do you think? Right: The Earhart Light, a daytime beacon placed on Howland Island... now a crumbling ruin.